Posted on 05 June 2016. I was embarrassed. It’s unprofessional to be associated with “evil” people with the desire or habit to recklessly bash eminent persons for no apparent reason, but to bring them down. Far from me any such intentions. In fact, if Mr Hichilema wasn’t educated, I wouldn’t bother criticising him as I’d give him the benefit of doubt. But he is educated and if we’ve to be helpful to him, we must tell him the truth. Personally, I’ve never hidden the fact that I’m not an economist-but an engineer! The little economics I know I have got from reading widely, books, articles, the stock markets, discussing with friends and following the world trends. In my profession, you don’t criticise without counter-facts or giving your side of the story. That’d be recklessness. And if in the process of this misunderstanding, I have hurt several other people apart from my friend, I apologise. You see, after he announced his 10 point economic plan for Zambia at Kitwe’s Freedom Park, Mr Hichilema ridiculed Mr Edgar Lungu for lacking a detailed economic plan for Zambia. I picked this up from newspapers. I don’t think all media houses could have misquoted him, so there’s some truth about what Mr Hichilema said. The message, so it goes, is that Edgar Lungu is not suited for the presidency because he doesn’t have an economic plan on how to turn round the ailing Zambian economy. Please don’t get me wrong, I know UPND supporters will cheer him on- because at face value, this is a fair and valid comment/accusation to make during political campaign periods. After all, everyone wants to win voters to his/her side and the economy of a nation is ever so critical in voters’ minds. So if you can convince enough other people to your side-you win. But, I’ve a question, and correct me if I’m wrong. Is it really more dangerous to elect a president who makes up economic policy on the fly than one who proclaims to have a detailed economic plan for us? I mean, like Mr Hichilema is telling us Mr Lungu has no plan. Remember he also coined the “Chimbwi No Plan” slogan not long ago. It means Mr Hichilema is convinced plans work-economic plans, financial plans and how I wish all his previous political campaign plans in 2006, 2008, 2011 and 2015 would have worked. I’ve also heard some folks say economic plans do work. And if you want my honest answer, it is a big No! It is not more dangerous to elect a president who makes up economic policy on the go like Mr Edgar Lungu. What else could he do under present volatile world economic circumstances that he has been forced to bite? The late Mr Michael Sata did plan on the go too—and don’t forget Dr Kaunda had 5, 10 and even 20 and 30 year plans-and all this is no worse than to elect someone like Mr Hichilema who thinks he can have the future of the Zambian economy neatly mapped out. However, this does not imply that the seat- of- the- pants- method-so to say- is less dangerous either. The underlying problem here is that we’ve two young competing presidential hopefuls and each one of them thinks they can manage the Zambian economy better than the other. I don’t know about you, but I agree entirely with Hayek. The way I understand Hayek’s reasoning here is that unlike in the sciences- supported by experimental evidence- with all conditions being met, you can predict the outcome, in economics we are all incapable of knowing what the future will bring. Which, to me, is a fair and realistic assumption to make? So, if we are agreeable, then it would likewise, seem that no presidential candidate is able to come up at any time during these campaigns or indeed after he is elected into office, with a detailed or air tight economic plan or can he or she accumulate a sufficient number of experts to be able to guide the behavioural wants, and needs of 15 million Zambians. For instance, if we were to have asked and demanded that Dr Kenneth Kaunda and his economic experts in 1985 develop a five or ten year plan for public pay phone booths and land telephone lines to our homes all over the country, we could have built up a massive public pay phone and house land line telephone infrastructure capacity around the country as that was what the people wanted. If someone in 1985 said that people in the future would give up using public pay phone booths and landlines and instead prefer wireless cell phone handsets which they could carry around on them, they would probably have looked upon them as mad. Similarly some clever civil servant would have demanded upon Dr Kaunda to set up say, a carbon paper factory to reduce on government imports of carbon paper and save on foreign exchange and it could have been justified as a jobs creation investment. Dr Kaunda could have set up typewriter factories as well to compliment carbon paper factories and even created more employment. But come the 1990s, the cell phone and IMB computer word processing technology, disc file storage and colour printing technology. The pay phone booth, landline telephony, carbon paper and typewriter (not to forget the telex and fax) have nearly vanished from the market place. We see that had the government of Dr Kaunda, reckless as it was on drawing up development plans of sorts, gone ahead and spent billions more on these plans, we wouldn’t be enjoying a mobility revolution. Worldwide technological advancement is happening at a lightning pace. Already before we even get to grips with 4G wireless technology, Verizon in the USA is already getting ready to kick start its wireless network up another notch with field trials on the so-called fifth generation 5G, technology within the next 12 months or by 2017. Now if you’ve been following this story, this has come far earlier than the time frame of 2020 that many in the industry had pegged for the initial adoption of 5G technology. We expect to see significant improvements in speeds just like the 4G wireless technology has driven an explosion of smartphone adoption and mobile services, 5G could similarly drive its own tech revolution as early as next year and not by year 2020 as previously planned. The point is that this extends well beyond cellular phones, public pay phone booths, carbon papers, typewrites and into all walks of our lives. So, it’s not a question of recklessly bashing Mr Hichilema, it’s because we seriously don’t need Mr Hichilema’s central planning on how we consume our energy, what cars we can buy, what we charge people for borrowing money and so forth. Besides, all behaviour is risky. 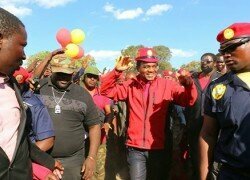 So even if Mr Hichilema and his team of expert central planners could somehow canvass all of our wants and needs and they were able to figure out when exactly we want to satisfy those personal needs, and they were able to determine who gets what in this world of scarcity, Mr Hichilema and his team of UPND expert planners would still fail-big time. This is because even all of us, I mean all people in Zambia, have no idea what we’ll want in the future. Look at it another way, say, if we were to ask Mr Hichilema’s Vice President for Administration Mr Godfrey Mwamba to write down exactly what he would buy next year on June 05, 2017 and put it in an envelope then open it up and compare it to what he would have bought on that day of June 5 in 2017, there is little doubt the results would be wildly different—unless of course he kept a silent copy—but that would be cheating. Mr Hichilema is going to do no better. Instead of a single individual failing to predict his own habits in a fun exercise, we’ll be malinvesting untold amounts of money into unwanted industries and imposing counterproductive and dangerous rules and regulations on businesses – the effects of which- are impossible to predict. Furthermore, Mr Hichilema must surely know by now that central planning shuts down innovation and the entrepreneurial process because it assumes to know today and now what is wanted tomorrow. Most innovation arises when someone produces a product we had no idea we wanted and couldn’t imagine existing. So, does Mr Hichilema’s 10 point plan for the Zambian economy inspire us to make him a more qualified presidential candidate to become the Republican President than Mr Edgar Lungu, whom he says has no plan and will likely create his economic plans spontaneously? My answer is a big No, and to my friend who’s reading this page today with keen interest to ensure that I’m not bashing our young man Mr Hichilema- yet again, I’d say that, in fact, it makes our young man more dangerous to the Zambian economy to assume he, and he, only, has the ability to do what countless other government officials over the centuries have never managed to do, predict the future. So now, my friend, I’m sure you now agree with me that I don’t just recklessly bash Mr Hichilema for political expedience, it’s just that I find the guy, like many other politicians, doesn’t know you can’t “Fix” the economy. Interesting but you have failed to mention that economies adapt with time. Just because we do not know what an economy might need in the future does not mean we should forego investing in the future.